Here we are already, the end of 2012! If we rehash the year according to Time Magazine, the top news event was Hurricane Sandy. The most popular tweet was “Four more years,” by Barack Obama. And the number one sports story was Lance Armstrong’s fall from grace. We are, by the way, also at the end of our yearlong Expletive Amos Boys blog. It’s been a fascinating journey, has it not? And just as the media has its top events, I’ve got my “top phrases.” They’re interesting expressions the Amos Boys used repeatedly in our weekly telephone chats. Should we be concerned that this was the introductory line to a disturbingly large number of Amos Boys conversations? Like the story of Duane finishing a night of work at Matthew’s Restaurant and landing himself smack in jail. Every once in a while the three guys came up with differing views of the same story. This, of course, is common for everyone as we remember events of our youth. What’s interesting though, is that in our year of reminiscing, I heard this comment most often from Bruce and it was always in reply to Duane and Jerry’s incriminating stories. Jerry made this comment more than a year ago when we first discussed the feasibility of doing this blog. At that time we brainstormed topics we wished to cover and how to coordinate the telephone calls. Jerry thought we should be an open book. He said even though none of them were big phone conversationalists, they’d give it “the Ol’ Beech Street try.” This rally, which references their house on Beech Street (you know, the one with the hard-as-rock front yard where all the kids hung out), is one he made several times throughout our project. If we’re going to be metaphorically streetwise, the Amos Boys not only gave it the Ol’ Beech Street try, they made 2012 a Grand River Avenue of a year. Each Monday, as we connected via modern technology, they reinforced what I’ve always known—that these three brothers are truly special men. I feel so privileged to have shared this time with them. Thanks Duane, Bruce and Jerry! But wait, what about the rest of us? Our conversations in the comment section have been a blast. The Expletive Amos Boys blog is online for the duration, so let’s keep the chatter going! And then there’s the reunion. Wasn’t last summer’s get together fun? Are you interested in having another? We need to start planning now—dates, location, activities! This year, on September 14, Laingsburg is celebrating its 175th centennial anniversary. Check it out here. Note the mention of the Laing family’s interest in participating. That’s us! And remember the helpful gentleman we met last summer in the Laingsburg restaurant? He mentioned the possibility of a parade float just for us (now wouldn’t that just be riotous:-). Whether this materializes or not isn’t important, but, just in case, we need to start practicing our parade waves now. It’s been a fun year everyone. Let’s keep in touch! Merry Christmas everyone! It’s a blessed time of year! As I talk about Christmas with the Amos Boys, I’m once again reminded of how special these guys really are (and funny, of course). When they were young and living apart, their Christmases were really quite different. Some brothers might hold resentment toward one another. Not these guys. Instead, they say, that’s just the way it was. And they give each other a lot of ribbing. “But I don’t think Duane and Bruce got too much,” Jerry adds. If you recall, Duane and Bruce lived with their mother Gladys, and while she worked hard, she didn’t have the financial means to provide Christmas luxuries for her boys. “We used to get a pair of high top shoes,” says Bruce. Isn’t that special? Here these guys didn’t have much, but they still bought Christmas gifts for each other. And they looked out for one another. Remember the story of the boys’ father, Roland, coming to the house with gifts, and Bruce and Duane made sure he brought one for Jerry too? Here’s an interesting article from 1983. By this time the Amos Boys are grown with kids and grandkids of their own. This article about their mother, Gladys, says quite a bit. She was a pretty nice and caring lady. That’s why her boys are too. In doing this blog, stories come up in ways I least expect. Like earlier this month when I was talking on the phone with the Amos Boys and the conversation drifted from one thing to another. It often happens that the guys say they don’t remember things. But inevitably what one forgets, one of the others fills in. And so it was when Duane wondered if he’d been baptized. Bruce was referring to his grandparents Wm. Arthur and Beatrice Amos, who he and Duane lived with in the later 1930s. I asked Jerry if he went to church when he lived with his grandmother Maggie and her husband Jim. Since then Duane’s been wondering more about his baptism. He still can’t remember being baptized, so I offered to call the Topeka Methodist Church and verify their records. Here’s where it gets really interesting. I contacted Pastor Tamra Gerber, of the Methodist Church, and it turns out she grew up in Topeka. When she was a girl, she and her twin sister often visited Arthur and Hazel (Arthur’s second wife). Talking with Pastor Gerber on the phone was really fun. When I asked about the piano, she described exactly where it was when she was a girl—the same place against the wall, to the south of the front door, just as I remember it. Then I told her I have that piano now. I sent her a picture of it, sitting right here in my dining room. I feel a bit of a bond knowing we both have made music on this very old instrument. Pretty cool, don’t you think? But what about Duane and Bruce’s baptism? Pastor Gerber said their records only go back to 1943, a few years after Duane and Bruce lived in Topeka. If they’d like to, she welcomes them back to reaffirm their baptism. And she welcomes all of us to visit her church. Have you ever noticed how food is like fashion? How it changes over time and what we ate in some eras, we may not in others? For example, the recipes we posted last week—many of them were from the 1960s and there were lots of jellos and sugar. Compare them to the healthier, natural foods we eat nowadays. The Amos Boys say they don’t remember their mother Gladys having any foods that were her specialty. Because she worked out of the house each day until 5 o’ clock, she didn’t have a lot of time for creative cooking. “I don’t think she had a recipe box or paid a lot of attention to recipes,” says Jerry. “Other than a few slips of paper here and there, I don’t remember seeing any of the standard cookbooks in our house. I remember her cooking a lot of liver. She would send us over to the back of Curtis’ store and he’d give it to us. I ask the Amos Boys if they had a favorite meal? “That was on the corner of Larch and Michigan, wasn’t it?” says Duane. I ask if the foods they ate when they were young were shipped in from far away? No, the Amos Boys say the food was pretty local. You know how we always hear that oranges were special treats for Christmas? That was true for them, as well. Interesting how that goes, isn’t it? Nowadays, local food is a popular buzzword and we’re willing to pay extra for it so we can “live sustainably.” Back then, however, people often struggled just to sustain life. 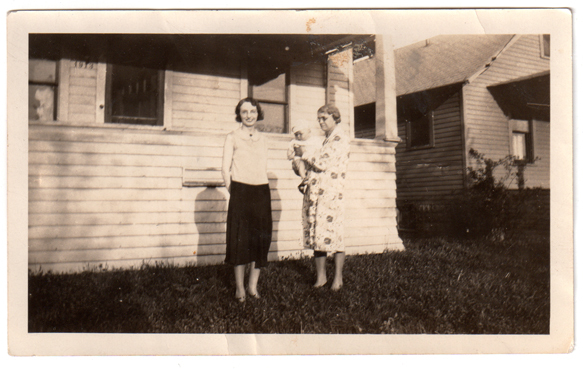 Duane, as a baby, with his mother Gladys. Do we know the woman holding him? So here we are into the final months of our Expletive Amos Boys blog and it’s birthday time for the very guy who prompted this year-long adventure. Yep, it’s Duane’s birthday, the oldest of the three Amos boys, and today, November 3, he is 81 years old. If his brothers were to razz him (although I can’t imagine them ever doing that), the first thing they would bring up is books. Apparently, Duane was a big reader, even as a kid. “Yeah, you used to get a little nappy with me about your clothes,” Bruce says to Duane. Apparently so much so that Bruce once locked him in the basement and Duane had to break his way out. Here’s one of Duane’s high school pictures. Don’t you just love that wavy hair? In high school, Duane added music to his repertoire and played trumpet in the band. Years later he would serenade his kids with renditions of Ciribiribin (but not on his own horn, since he left that behind at a high school graduation party). 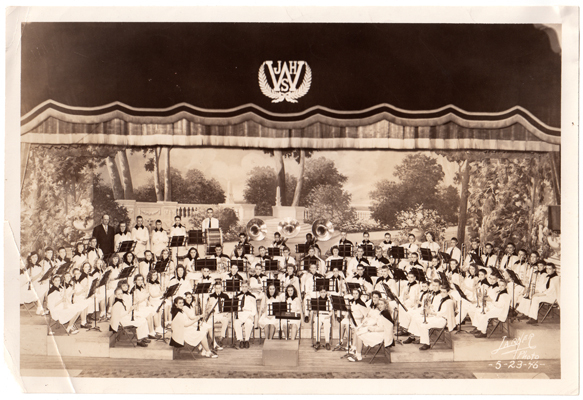 He would also regale the day he skipped school (imagine that) to hear Louis Armstrong in Lansing’s Michigan Theater. Isn’t this interesting? 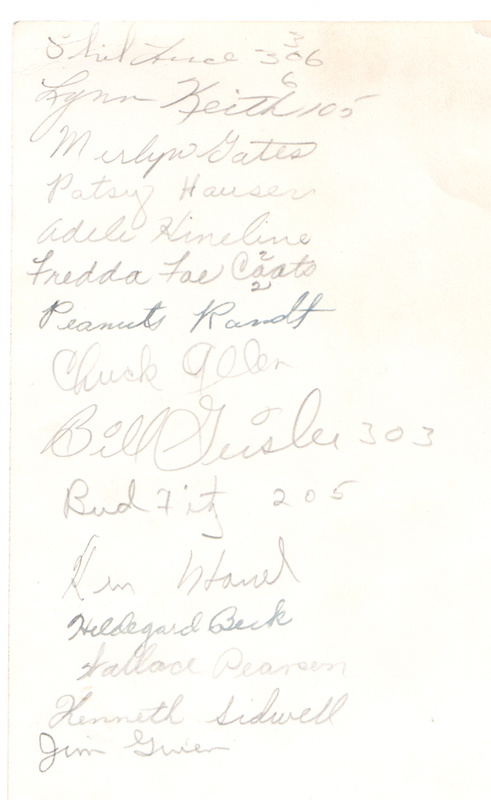 It’s the back of the band photo and Duane’s friends all signed their names. 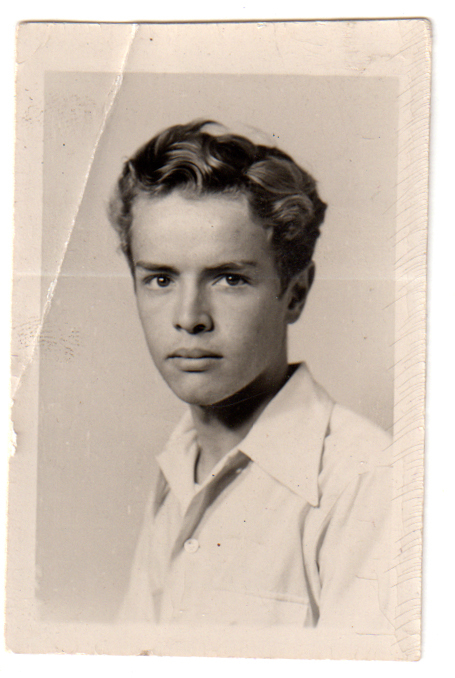 In 1949, two days after he graduated from Eastern High School, Duane headed down to Topeka, Indiana. Duane lived in Topeka for about seven months. There he learned the fine art of blacksmithing; i.e. holding the hooves of heavy workhorses and swearing at high strung steeds. He also learned a small town with only one streetlight is pretty boring. “There was nothing to do. I didn’t have a car and Grandad never offered me his. Once in a while I went out with other kids, but even then, there was nothing to do. 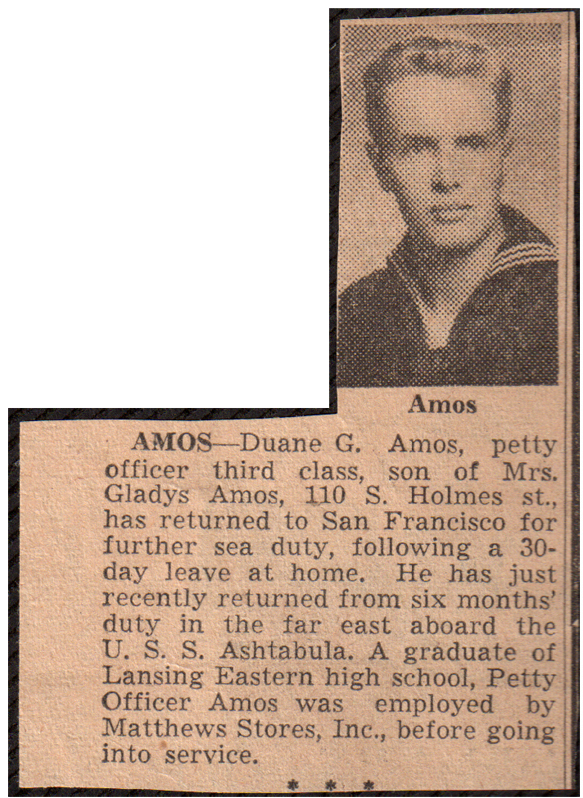 So in February 1950, Duane came back to Lansing and by that September he joined the Navy. “When I came back from Indiana I was taking some business classes from Lansing Business College and there were quite a few veterans who told sea stories. I guess I got a little enamored by them so I went and signed up,” says Duane. Duane spent 46 months in the Navy (two months shy of his full 4-year duty because the Korean War ended and Truman cut short the enlistments of personnel). While serving, Duane studied fire control and spent almost a year in Washington D.C. From there he served aboard the U.S.S. Ashtabula. And, of course, it’s during his Navy years that Carol came into his life. By now we’ve heard the story how Duane was on leave and met Carol at Benny’s Drive-In. I ask him how that went—like did he call her up again after the night they first met? Or did he write to her once he returned to duty? Duane is not exactly a man of expressive words. But when pressed, he admits he wrote Carol “most every day” during his time on the Ashtabula. 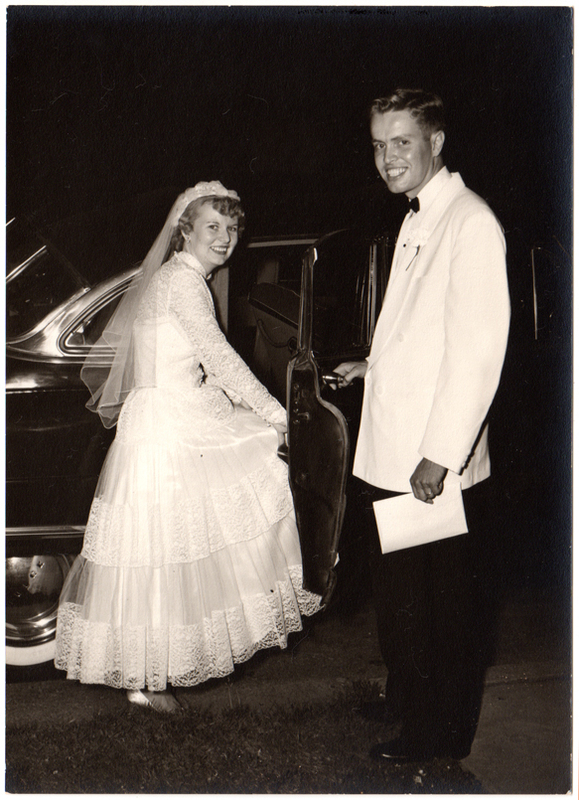 And on July 18, 1953, while he once again was on leave, the two of them were married. When Duane got out of the Navy, he and Carol settled in Owosso. He began an electrician’s apprenticeship with General Motors in Flint and for the next 42 years he dedicated himself to keeping those cars rolling off GM’s production line. So, yes, Duane went to work each day. When he came home, he still liked to sit down and read a book. But you know how that goes when life gets busy…there’s a house in the country to build, 4-H clubs to supervise, and school activities to attend. Duane did all of these things, and more, with great love and dedication. In 1999, Carol, his wife and friend for 46 years, died from a three-year battle with cancer. Duane then kept himself busy with traveling and his dog Jake, but life just wasn’t the same. In March 2001, he was blessed once again with the love of a wonderful woman when he married Jan.
Nowadays, Duane and Jan keep active with daily life and lots of kids, grandkids and great-grandkids. But let’s back up a bit to those Amos kids. Here’s a word from each of his six kids! 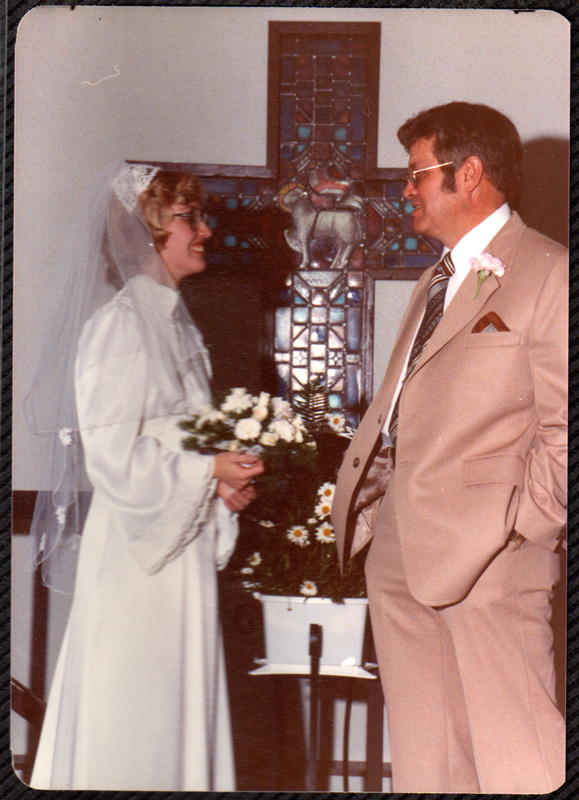 Duane, as father-of-the-bride, with Terri, 1980. Is always my earthly dad. Pointed me to my Father above. Being 56 years of age, I should have tons of stories to tell about Dad. But since I have to share space with my siblings, I am forced to be concise. The above poem says best what I feel about Dad. Earthly fathers are to be an example of our Heavenly Father, so that we as children can know God. And Dad did just that. Dad and I spent a lot of time in the car. Seems like Dad was always driving me to school. Sunday School, Christian Day School, Michigan Lutheran Seminary, Dr. Martin Luther College, and finally Salem Lutheran School where I would teach in Edmonds, Washington. Dad was doing what he could for my education. More importantly, he was doing all he could for my spiritual education. And finally, Dad was helping me become what I wanted to be—a Christian Day School Teacher. Thank you Dad for being the kind of dad that leads his children to the Heavenly Father. That is the best gift you could give us. I love you very much. Happy Birthday! Duane with his family; Carol, Dave, Terri and Diahann, 1961. When I was a kid my dad would squeeze my biceps and say, “Just feel these muscles!” Or he’d play catch with me as I practiced becoming an all-star windup pitcher. Anyone who knows our side of the family is well aware we have not one iota of genetic muscle or athleticism. 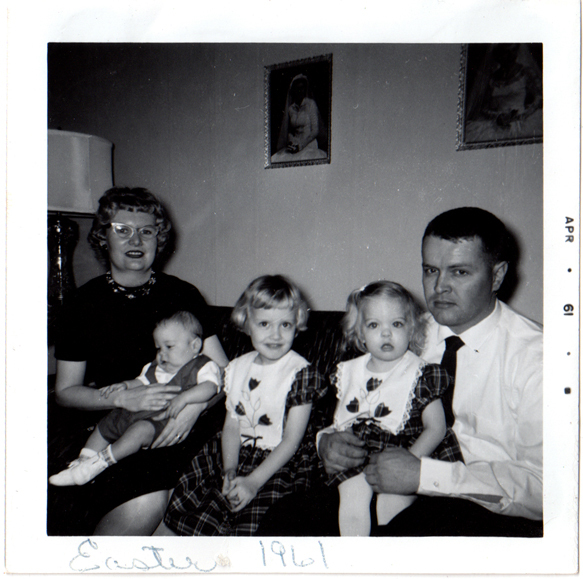 The point is my dad gave us confidence and hope, no matter how unrealistic it may have been. I’ve thought about confidence a lot while doing this blog. The Amos boys’ parents didn’t give them an ideal example for marriage or parenting. It’s unlikely the three of them went boldly into the unknowns of their adult lives. Yet all of them married, raised children and created the legacy we cherish today. In my eyes, my dad will always stand on the highest of pedestals. I admire him for all he’s accomplished just by steadily going forth and not whining or complaining. I laugh at his gruff exterior, knowing full well there’s a caring, sensitive and emotional marshmallow underneath. And most of all, I’m blessed. Because of him, I’m confident of the hope God gives us—the whole Amos family together—for an eternal life in heaven. Love you lots Dad! Happy Birthday! 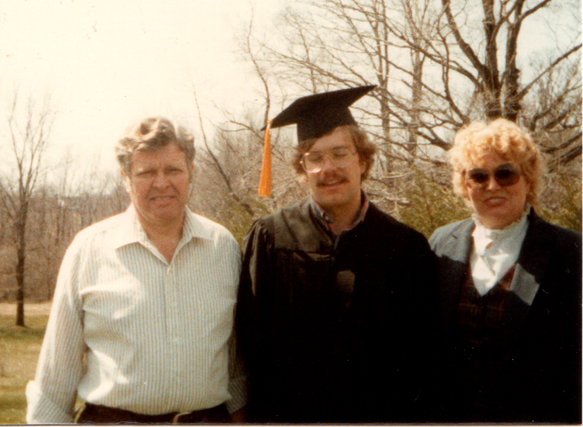 Duane and Carol, with Dave on his graduation from college, 1983. I remember as a kid having to help Dad work on the family car or tractor, usually on miserably cold winter days. These were apparently male bonding moments, since the girls were allowed to stay inside and watch TV. My contribution was mostly in a supporting role (“Can’t you hold the flashlight steady?! ?”), shagging tools (“What do you mean you can’t find it?!? It’s in the basement right where I told you! !”), and crawling under the car after dropped sockets. These shared afternoons convinced me that neither one of us would be mistaken for Mr. Goodwrench and having the right tools would have made all the difference in the world (“Let me have the vice grips… No!! The vice grips! Those are the channel locks!”). I did learn the fine art of muttering under my breath though (“What did you say?!?”). Working on the cars with Dad taught me that being an adult meant doing necessary jobs, whether they were pleasant or not. I doubt Dad enjoyed working on the cars, but he never shied away from any work that had to be done at home. That is one of the many lessons he passed on to us kids. Though he’d rather be sleeping, Dad took care of me weekdays after working third shift while Mom was a cook at school. It worked out that grilled cheese sandwiches were the extent of Dad’s cooking ability and my culinary vocabulary. A man who cooks remains priority in my heart still. By time I enrolled in kindergarten, Mom was back home in the new big house and Dad still wasn’t getting enough sleep. Dad’s sleep was always an issue. On scorching summer days we’d find him sleeping in the basement, bug him until drove us to the lake, and leave him sleeping in the car while us kids cooled off in the water. The following year we scored a swimming pool. We also scored lots of animals, activities, sport points and recitals. If Dad wasn’t working he was with his family, providing, protecting, and governing. 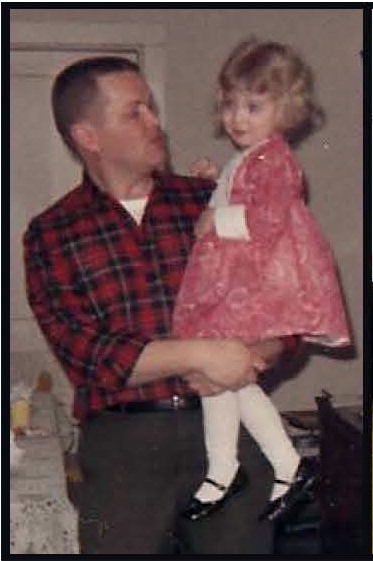 He taught me repeatedly to be grateful for what I have, to do what I say I will do, and to “stop or there’ll be war.” In a large house full of kids and dogs, Dad must have felt like he was still on a ship, steering us all through unknown memorable waters. Friends who see pictures of Dad say he looks like a diplomat, a Viking chieftan, Santa, and of coarse tired. While he fits all of the above, when I see Dad I’m ready for a big hug, some sandwiches, and a nap. Happy Birthday Dad, everyday I thank God you are my Father. And a special big thanks for bringing Jan and her family into our lives which has enriched us all. 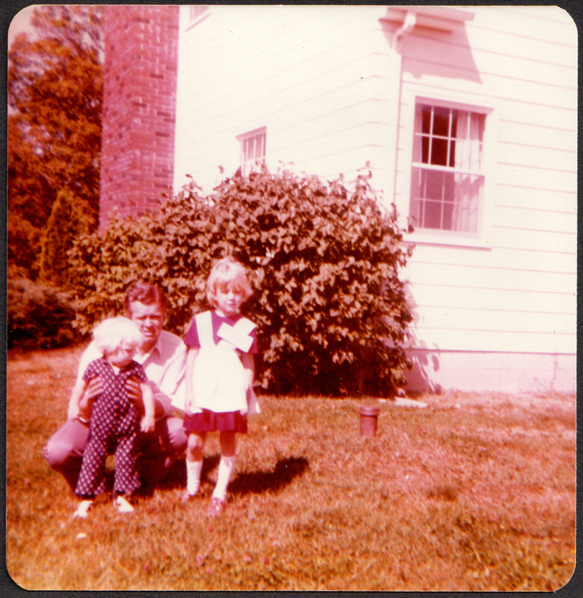 Duane with Rebecca and Joel, on Rebecca’s first day of school, 1976. Before I went away to college, Dad went over how to do some basic car maintenance like changing a flat tire (which has come in extremely handy more than once!) and checking and adding fluids. He said I needed to be prepared for anything, driving in Milwaukee. He would be seven hours away and unable to come quickly and rescue me if I needed help. Years later, the winter after mom died, Dad came for a visit. We were talking and I apologized for living so far away from him and mom. For not being able to come home and help as much as I would have liked to. He said no, that he and mom were so proud of each of us kids and the lives we were leading. 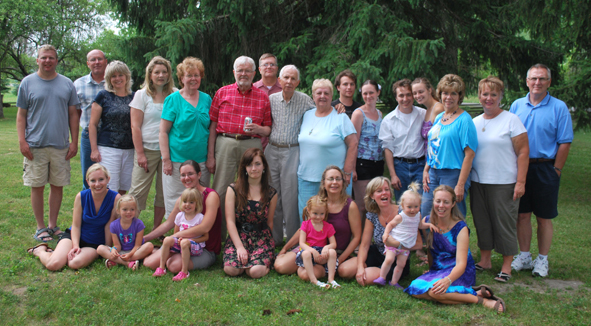 And even though he and mom missed each of us kids and all the grandkids, they were happy and proud that the hours between us forced us to handle our own lives and not come running home every time we had a little problem. He knew that each of us could handle whatever life threw at us like the responsible adults he and mom had raised us to be. Now whenever I am unsure what to do, I take a step back and think of Dad’s words. Then I remember that yes, I am a responsible adult and I have the tools to deal with problems big or small. To make my own decisions. To stand on my own two feet. Because I have the best Daddy in the world, who first taught me these skills and then stood back while I flew away into the big world and used them to live my life. Thank you Dad! I love you! Happy birthday! No wonder Duane never got any sleep! 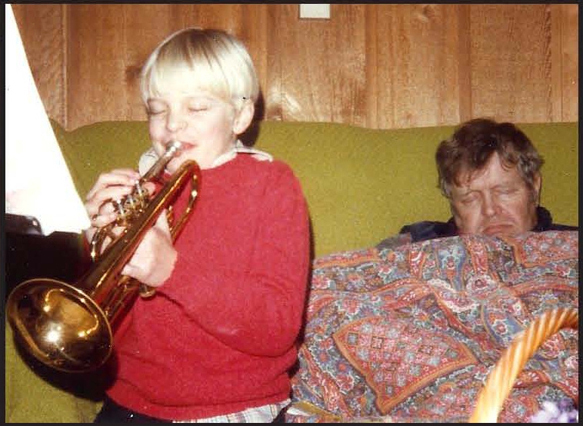 Joel practicing a trumpet, 1986. When I think of Dad (Duane) as a father, the one word that comes to mind is sacrifice. Dad made countless self sacrifices for the benefit of our upbringing, and also not to have to listen to us whine. He sacrificed many family vehicles so that his kids would have something to drive when needed. I know I smashed up two of them. Or was it three? The steel siding of his garage took an awful beating while it was used as a backstop during my years of baseball development. I’m sure many hours of peaceful newspaper reading were unavailable as we all learned to play our various musical instruments. Why once, he even sacrificed his big toe so that we could have a nice lawn! 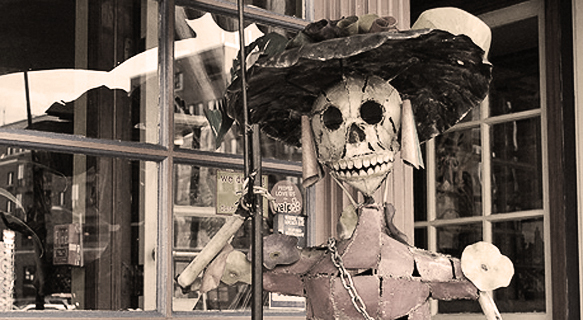 Well, here it is once again—that goblin and ghoulish time of year. Do you ever wonder what Halloween was like back in the 1930-40s? Or how the Amos boys celebrated, if they did at all? Obviously things were different back then. Jerry says most parents were too busy working long hours for the war effort and trying to make do. Although he does remember tricking-or-treating once when he was about 11-years old and living with his Grandma Maggie and her husband Jim Adams. It’s too bad we don’t have any pictures of Jerry and his friends with their hands full of jelly. 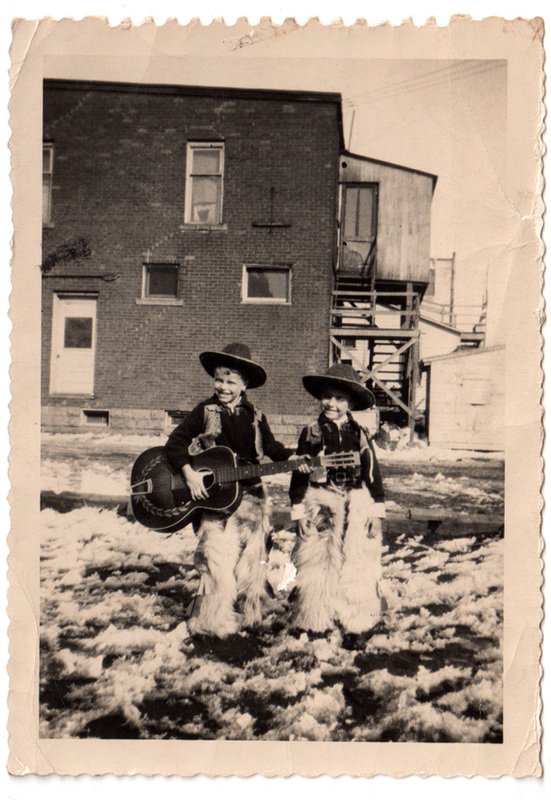 We do however have this cute snapshot of these two cowboys, Duane and Bruce, although I’m betting it has nothing to do with Halloween—not the stories they tell anyway! “I don’t remember doing any trick-or-treating. I suppose the tricks we did would be considered next to vandalism,” says Duane. “There were a couple houses we picked on quite a bit. I wonder what vandalism they did? Bruce has a Van story as well. “Once we tied a rope to his front door and then wrapped it around his house and tied the other end to his back door,” says Bruce. “Then we made a lot of noise so he would come out. Bruce remembers another incident with someone down the street—a woman and her friend. Seems like the mention of police comes up often in the Amos boys’ stories, doesn’t it? 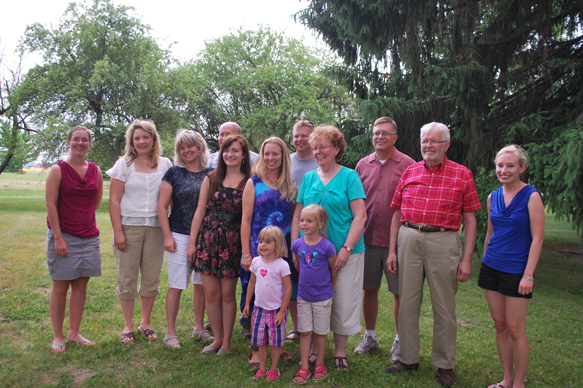 One of the funnest things about our reunion this summer was noting the obvious similarities in our family traits. From the cleft of a chin passed on to generations of men to the hilarious laughter exchanged between the female cousins, there are many cool things we Amos folks share. These common traits carry through in the way we speak as well. When I listen to the recordings of my conference calls with the Amos Boys, I hear my sisters in myself. In the Amos Boys’ voices, I find memories of my grandfather and great-grandfather. A while ago the Amos Boys and I were talking about school. By now we know the three of them and school didn’t always jive. The stories they tell are funny and I’m excited to share them with you, as told by the guys themselves. Here’s one by Bruce (click here). Don’t you just love the resonating gravel of his voice? Speaking of handwriting, Duane also has a story (click here). Apparently, he didn’t take the fine art of penmanship as seriously as did Bruce. Hmmm… (click here to hear Duane speak first, then Bruce and then Jerry)…considering Jerry is the teacher among us, wouldn’t you figure him to have been a well-read, scholastic child? And then there was after school. The loving banter the Amos Boys display today obviously goes way back to when they were boys (click here). As we close this week, I have to comment on our conference call good-byes. Sometimes we’re like the Waltons, with the brothers all saying good-bye to each other. Other times the good-byes are like the one below. There’s something to listen for. You know how each family has that someone who binds everyone together? It’s the person who organizes the gatherings, pulls in the strays, and speaks his heart for those who sometimes have trouble speaking their own. Listening to the Amos Boys, it’s easy to hear which of the three that someone is. He kept his older brothers in line back then. He keeps them in touch with each other now.